The other day we tested whether you could tell the difference in dosage levels or not. 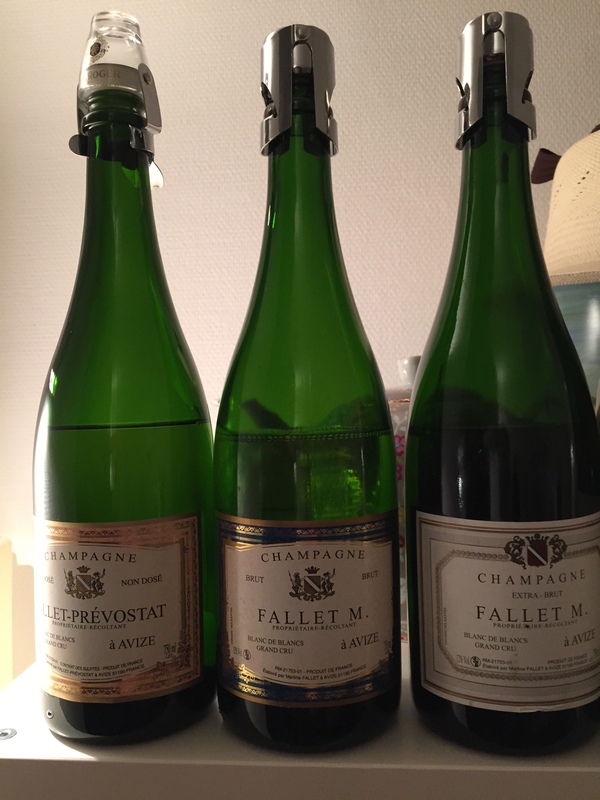 I opted for one of my favourite Champagne growers, Fallet-Prévostat. It is a tiny domain, about 9 hectares, all grand cru land in Avize. The couple running it can only be described as really really old, and their house, inconspicuous without any sign, is simply ancient. The tasting room has not been changed for the last 30-40 years, as have the tiny tasting glasses. If you call them for an appointment, they will never have time unless you can already tell them how many boxes you would like to buy. I think that they are more known in Belgium than in any other country aside from France, as a well-known journalist covered them a couple of years ago. Ever since, the lady of the house claimed that about 70% of the foreigners visiting them are Belgians. Whenever I talk to vignerons in Champagne mentioning that I have an appointment with Fallet, they get jealous as they never get an appointment themselves! The wines are magnificent, aged seven years sur lies, fermentation in big wooden casks, everything done as natural as possible (also because I think that the most modern item in the house is the phone, not a cell phone but an actual rotary dial). The wines are very complex on the nose, ever so slightly oxidative but with ample elegant fruit, apples, berries and honey. These are champagnes that really start to shine on the second day. Open them up a day in advance, close the bottle and leave it in the fridge. Take it out and wait a while to warm it up a bit and you will have a stunning glass. The goal was to taste the brut, extra brut and non-dosé blind in order to see if we could spot the difference. Luckily for us, we could! The brut was easily identified by the creamy sensation in the mouth. It is a beautiful champagne but when compared to the other two it felt a bit too heavy. I found this rather strange because I never had the same impression on other occasions (it is my go-to champagne for guests). For me personally it was a tie between the non-dosé and the extra brut. They were both elegant, straightforward but showing a lot of depth and a bit more “clean” in direct comparison to the brut. That being said, the difference was not as big as between the extra brut and brut. I retasted the extra brut after four days when I got back from Saumur, and while the oxidative note had become more distinct, it was still fresh with nice and subtle bubbles. This silly and extremely scientific experiment goes to show that dosage is there for a reason. It is relatively easy to identify when comparing them one on one, but I think that it would be a lot tougher to figure out the dosage if presented blind with a single bottle in front of you!